Today’s world is getting smaller every day. Thanks to the fast-growing technology sector, communications between people from all over the world are becoming easier and more commonplace than ever before. Right now, technology is all about mobile and staying in touch anytime and anywhere. Unfortunately, the mobile market is completely sliced up between a few different companies. Too often, users have to choose who they communicate with because they use Android phones, iPhones, or don’t even own a smartphone. No more are people simply stuck with the circle of friends they already have. Now, people have a choice in who they communicate with because WhatsApp is a cross-platform app that allows people to send messages, videos, files, and more without regard to smartphone type and platform. Staying in touch with those that we care about is very important. Leaving this up to just any app is dangerous, especially with people relying more heavily on messaging rather than traditional phone calls. WhatsApp is available to almost anyone, no matter where they are or what technology they have access to. One of the most interesting things about WhatsApp is the ability to use across any platform. No matter if you’re friends are using Android, Mac, iOS, or almost any other platform, you can always stay in touch with the free WhatsApp messenger. 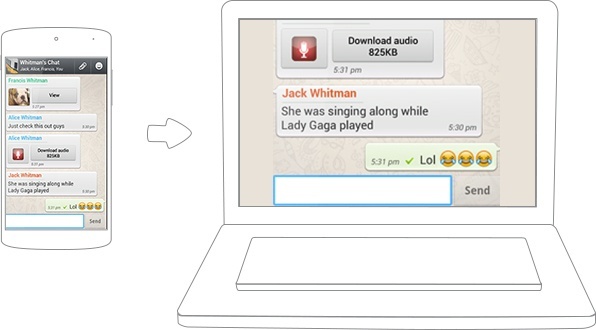 Using WhatsApp is even easier on your PC. Instead of looking at tiny screens and using small on-screen keyboards, you have the ability to see your messages clearly on a large screen. Replying via your keyboard is so much quicker than using your touch-screen keyboard your friends will be amazed at how quickly you respond. Using WhatsApp is even easier on your Mac. Instead of looking at tiny screens and using small on-screen keyboards, you have the ability to see your messages clearly on your large, Mac screen. Replying via your keyboard is so much quicker than using your touch-screen keyboard your friends will be amazed at how quickly you respond. For times you are on the go, you will want to have WhatsApp handy on your iOS devices. Downloading and installing is a breeze and similar to other mobile apps. Begin by launching your iTunes App Store from your iPhone or other iOS devices. Hit search to find nd click on the WhatsApp icon within the store. For the first year, WhatsApp is free to new iOS users, so click on the pricing button and begin your download. After download and installation are complete, click on your new WhatsApp icon and begin chatting with your friends. For the growing throngs of Android users out there, grabbing the latest version of WhatsApp is just like any other app download. Go to your Google Play Store and search for WhatsApp. Once found, click the icon and hit install. The process will begin automatically since WhatsApp is always free for Android users. After installation, click on the WhatsApp icon on your mobile device and set up a new account. It is always possible to use the best messenger app available right from your computer. To do this, you will already need a WhatsApp account through your mobile device. By installing and using the WhatsApp Web app, you are simply adding an extension of your existing account. This doesn’t create a new account, but it just syncs messages and other account info between your mobile and computer world. Visit the WhatsApp Web app page on your computer. Then open the WhatsApp Web section on your mobile app. Scan the QR code on the web page with your phone. It’s that simple. To unlink your account, head over to the same section on your mobile device to view or change logged computers on your account. Install FREE on your PC today!